Points Above Average estimates the value contributed by a players shot attempts. High shooting efficiency combined with a lot of shots produces stellar numbers. Poor shooting efficiency combined with a lot of shots produces negative numbers. A low usage player has to be an awesome or a terrible shooter to move the needle away from zero in a dramatic way. Historically big men have dominated the list of great scoring seasons. Eleven of the top fourteen scoring performances in NBA history have been produced by centers or forwards. Wilt Chamberlain, Kareem Abdul-Jabbar and Alex Groza take up most of the space both figuratively and literally. A trio of guards have managed to make their way into the inner circle of all-time great scorers in pro-basketball history. Not surprisingly the revolutionary shooting performance this season by Stephen Curry leads the pack. 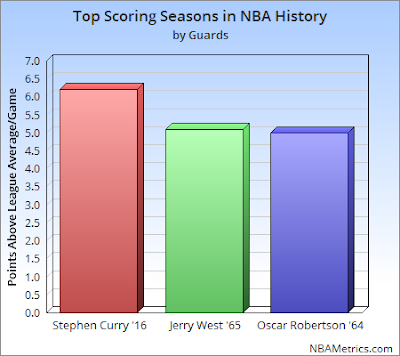 It may be interesting to see that both Jerry West and Oscar Robertson had scoring seasons more valuable than any posted by the great Michael Jordan.